Cobalt blue: That's the color Shelburne Museum has painted its gallery for the current exhibit, "Harold Weston: Freedom in the Wilds." On the lower level of the Pizzagalli Center for Art and Education, the electrifying hue provides an appropriately charged backdrop for the energetic paintings of 20th-century artist Weston. The very walls seem to illustrate how color held him in thrall. The exhibition pairs two distinct bodies of work: Weston's unfettered, modernist Adirondack vistas from the early 1920s — in charcoal, pencil and oil on cardboard and canvas — and the more austere but richly colored abstractions of his 1968-72 "Stone Series." Also on view are samples of letters to his wife, Faith Borton, written in cramped and slanting cursive, as well as journal entries and photographs. 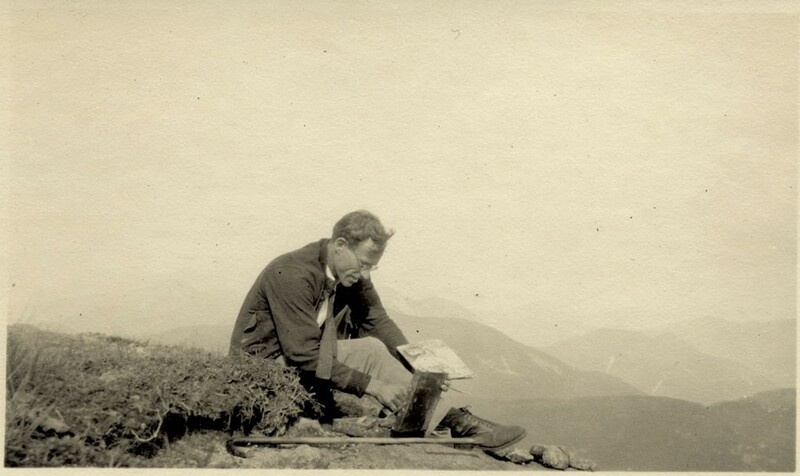 Dubbed "the Thoreau of the Adirondacks" for his spiritual embrace of nature — in his writing as much as his painting — Weston lived at times in a one-room cabin near Saint Huberts, N.Y. During daily hikes he would sketch his beloved mountains and the attendant atmospherics, completing canvases later in his cabin studio. Over the winter of 1921-22, Weston was there alone, a feat of endurance that would test the hardiest soul. He managed it with a disability: Polio at age 17 had left him with a paralyzed leg. But a condition that might cause many individuals to choose a cautious path had a different effect on Weston. As his granddaughter observes in a video on the museum website, "I call his personality 'wild exuberance.'" Weston, she says, was fearless. The same might be said of his art making, which in some ways belied his formal education. Born in 1894 in Merion, Penn., to a family of some means, Weston benefited from early travel and schooling in Europe and, later, from fine art classes at Harvard University. He served as editor of the undergraduate humor magazine the Harvard Lampoon, to which he contributed a number of cartoons. Did that experience influence his painting? Perhaps. Weston defined mountain peaks, trees and even clouds with firm outlines. His Adirondacks are more curvaceous than jagged. The foregrounds of his pictures are often mound-shaped, as if the earth is heaving with barely contained excitement. Clouds and trees are voluptuous, bulbous. In particular, Weston's painting "Birch Tree" seems to stand at the intersection of van Gogh's vibrational impressions and modern graphic art. It is almost, but not quite, cartoony. Weston's skies, meanwhile, have a life of their own. 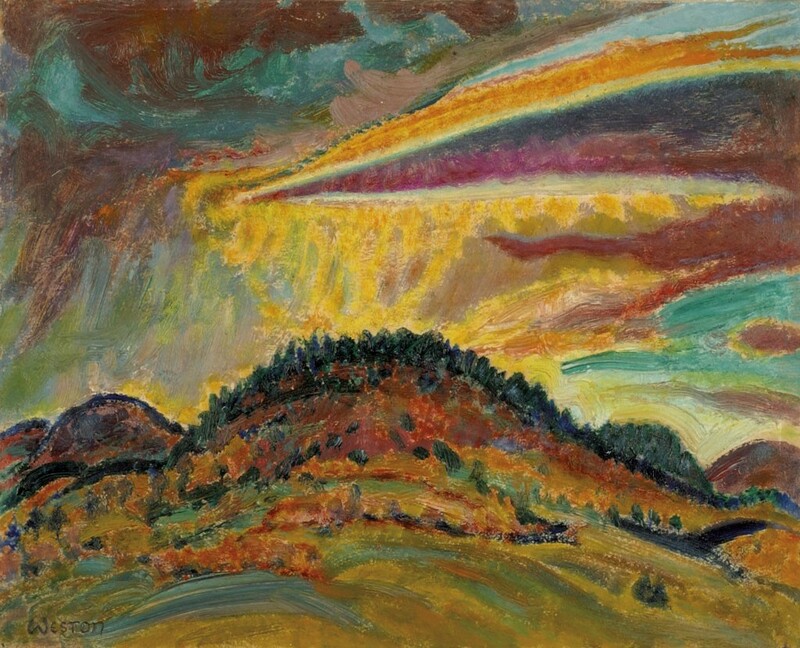 The colors of a sunset might separate into dramatic streaks and swirls, as in the vibrant "Sunset Over Baxter Mountain." In "Sunrise From Marcy," Weston captured the moment when the ascendant sun kissed the rims of an entire purplish range; the sky overhead is layered with pastel eyebrows. Throughout this time in the Adirondacks, the self-sufficient mountain man/artist also made his own picture frames, carving them from pine and lightly gilding them. In 1922, a solo exhibition in New York City of Weston's Adirondack work was a popular and critical success. 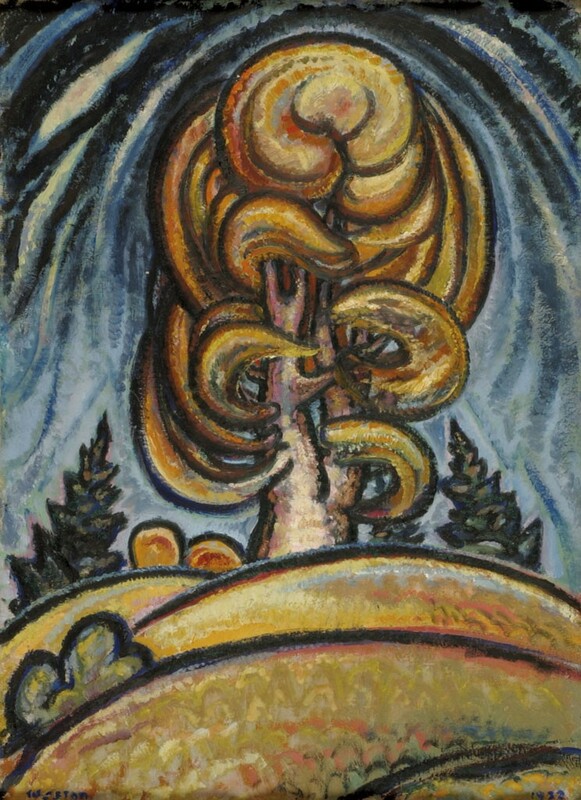 Another influence on Weston's work was his experiences during World War I. Unable to enlist, Weston volunteered with the YMCA in Baghdad. There he established an art club, encouraging soldiers to pass the time by drawing and painting. 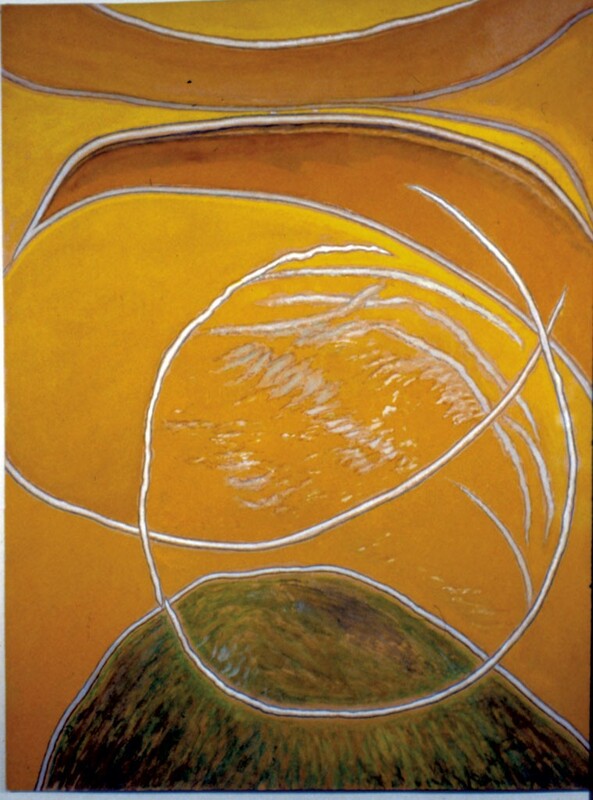 While his exposure to the Middle Eastern desert undoubtedly influenced his artistic palette, Weston was also affected by the suffering he witnessed. The experience would later lead him to paint murals for a federal program during the Great Depression and to step up his political activism during World War II. In 1943, Weston founded Food for Freedom, a coalition of American organizations that advocated for food aid for refugees. He lobbied First Lady Eleanor Roosevelt with his ideas for an international food relief organization, efforts that led to the creation of the United Nations Relief and Rehabilitation Administration. About a decade later, Weston's organizational skills met up with his love of art: He established a group that petitioned the federal government to support artists' efforts. Eventually, that group helped push through legislation to create the National Endowment for the Arts. Weston never completely abandoned painting during these years, but in the late '60s he launched into a new body of work — the "Stone Series." The paintings are inspired by the calcite striations in Iberville shale, source of the smooth, gray and white rocks that are found on the shores of Lake Champlain. A selection of these works, in gouache on toned paper, appears at the back of the gallery. If Weston's Adirondack landscapes are unruly, these are calmer, more serene cousins. The vermicular patterns in the stones are precise and controlled. That said, Weston remained enamored of curves and swoops, as well as of luscious color. A closer look at some of the paintings reveals pointillistic patterns within a seemingly solid field. The piece titled "Forever Wild" is, paradoxically, the most stylized. Yet its vertically arranged, string-like lines, which meet in sharp points at the top, may represent the mountain peaks the artist so loved. Of these abstractions, Weston himself wrote, "They have but one major objective: to express through juxtapositions of form, color and suggested movement whatever an inner force requires me to paint at that time." Weston died in 1972, seemingly in the moment with nature until the moments ran out. The original print version of this article was headlined "Where the Wild Things Are | "Harold Weston: Freedom in the Wilds," Shelburne Museum"